What is a problem? Are there really any problems? 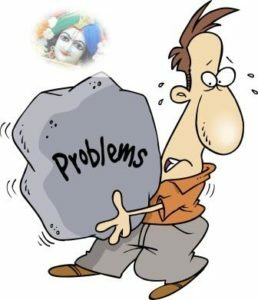 When we see everything as Krsna’s mercy, we see that “problems” are meant to help us; they are simply opportunities to learn and grow. This means there really are no problems; there’s only mercy. Thus, the only problem is that we think there’s a problem. So what’s the problem? Good question. That’s what this issue is all about. Is it really possible to see everything as Krsna’s mercy and thus see how everything is helping us become more Krsna conscious? I think we can. After all, the material world is designed to rectify us and thus get us back to Godhead. Therefore everything here is ultimately meant to help us. Of course, it’s easy to see the material world as a place of suffering and distress, a place where mercy is scarce. Prabhupada however describes this distress as another aspect of mercy. Srila Prabhupada is saying that it may appear to be suffering, but it’s not; it’s really a gift from Krsna meant to reform us so we can further advance in devotional service. It’s just that sometimes Krsna’s gift wrapping can fool us. When we become devotees our karma is dissolved, but it happens gradually, and it happens in a way that best helps us advance. Krsna can use our karma to teach us what we need to learn. That’s because sometimes the only way we learn is through suffering. So when you are in distress, instead of lamenting and asking why does this have to happen to me, or instead of pointing the finger at someone, it’s best to ask, “What is Krsna trying to teach me? This will enable you to see how adversity is actually helping you, how it is really Krsna’s gift on you – and how you really need it. One time Srila Prabhupada became practically like Lord Nrsmhadeva when chastising a devotee. He was so angry that another devotee who witnessed this was terrified. This devotee asked Prabhupada what we should think when the spiritual master chastises us. Prabhupada said you should think you are very fortunate because out of billions of people in the world the spiritual master is taking the time and care to correct you. Similarly, if we see how our so-called suffering is meant to correct us, we will feel Krsna is taking special care of us. I am sure you have also gone through difficulties that have made you stronger, wiser and better equipped to deal with the difficulties you face today. Is that not a gift? Is that not Krsna’s mercy on you? When going through a difficult situation, asking a question such as, “Why do I have to suffer like this? will make things worse. You need to ask empowering questions. Ask how it’s Krsna’s mercy and what you’re supposed to learn. This enables you to receive the special gift Krsna is giving you – the gift of utilizing the situation to learn an important lesson. Make a list, either on paper or in your mind, of some of the people that have helped you in your life (gurus, devotees, parents, teachers, authors, historical personalities, etc). Next make a list of some of the people who have hurt you. Now go over the list of those who hurt you. Did any of their behavior cause you to learn a lesson or become stronger? If so, move their name to the list of those who helped you. The point is obvious. The “enemy” is often the friend. Similarly, the “negative” situation may really be a positive one. When seen this way, so many “negative” situations can actually strengthen you. Srila Prabhupada says, “if one is serious to become Krsna conscious, then all these material impediments cannot check him.” Not only can they not check him, they increase his determination to be Krsna conscious. So when you confront what you perceive as material impediments, understand that it’s only your perception. There are no material impediments. There are only opportunities to become more Krsna conscious. After all, in the end it’s all mercy, Prabhu. Take a look at something you perceive as bad or undesirable, something that is causing you unhappiness or distress, or that you feel is an impediment to your bhakti. Then ask yourself any or all of the following questions and see if you can’t uncover Krsna’s mercy disguised in His own brand of unusual gift wrapping. How can this help me (how is this helping me now)? Why is it important for me to go through this? It’s important to note that I am not saying that you don’t make an effort to change yourself or improve your situation. One of the things you might discover by doing this kind of questioning is what you need to change in your life and how a negative situation is really providing the impetus to make the change.